Valkyrie Shoals draws its name from Norse mythology, following on from Ragnarok Island on Baie de l'Amore, and the neighbouring island Valkyrie Island, through which the Odin River runs. 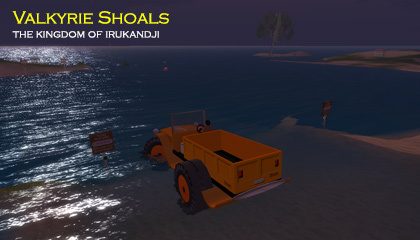 Almost unique to Irukandji sims, Valkyrie Shoals was also one of the few to never undergo major re-terraforming. A very technical section of the Trans Irukandji Causeway traverses Valkyrie Shoals, joining Valkyrie Island to the state capital, Hephaistion and onwards to the western states of Jillaroo and Kalamat. The northern edge of Valkyrie Shoals provides a deep sloping beach for residents of Valkyrie Island. 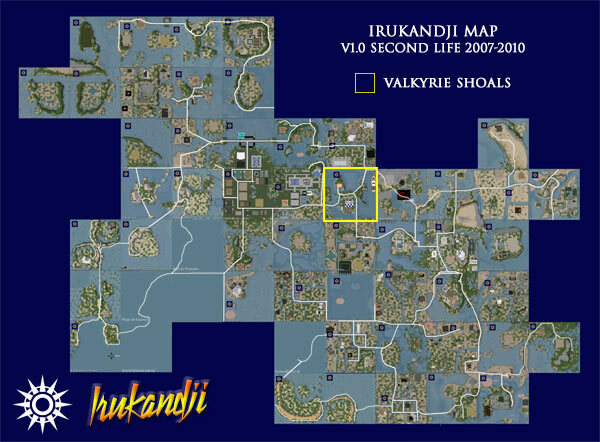 In late 2007, Valkyrie Shoals became home to the Irukandji Police following a prim shortage on Tamita Island. The move worked out well, given the close proximity to the estate team at the winter palace on Hephaistion. Regions adjoining Valkyrie Shoals, clockwise from west, are Hephaistion, Arms of Patroklos (later Palace Lagoon), Valkyrie Island, Convict Island, Baie de l'Amore, Nouvelle Kiribas, and Baie de Citron. Below are a few photographs of Valkyrie Shoals that I took during my travels.